As a very fair, pale, blonde girl I barely tan. Going on holiday once a year gives me a touch of colour, but nothing more. Therefore, you’d think I’d be super knowledgeable about fake tan in an attempt to add some colour to my skin, but you’d be wrong. Until a couple of months ago, I’d never bought fake tan. A couple of times, I’d stood staring aimlessly at the fake tan shelves hoping that I’d somehow know which one to buy or which one would be most suitable for my skin, but unfortunately, I remained clueless. However, this year I’m not going away until later in the year so knew I couldn’t go through the whole of summer without a tan, so thought it was time to invest in some fake tan. I asked my lovely Twitter followers for some advice on the best brands and products and Bondi Sands Self Tanning Foam came out top. As a fake tanning newbie, I didn’t want to spend a fortune on any product in case it all went wrong and I ended up wasting all my money, therefore at £14.99 Bondi Sands sounded like the best brand for me to try. Even after I’d bought it, I waited a good few weeks before I first used it as I was still so scared. Again, I reached out on Twitter for everyone’s hints and tips and eventually plucked up the courage to fake tan for the very first time. 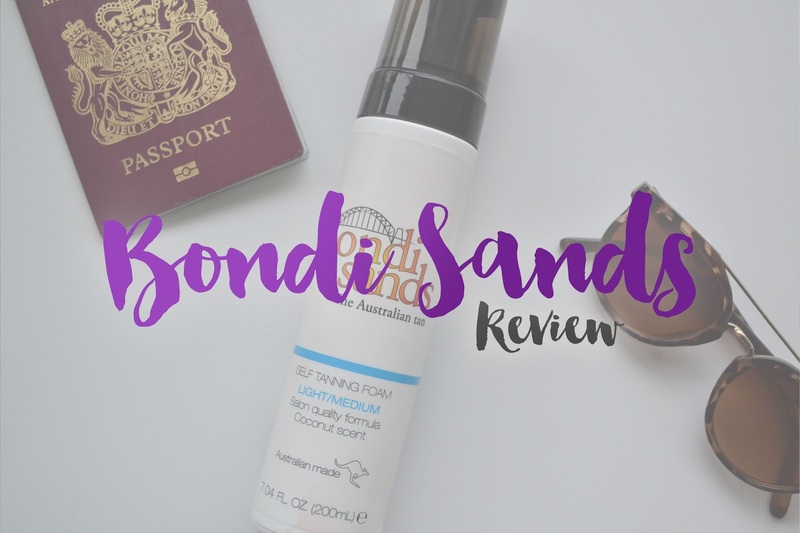 What did I think of Bondi Sands Tanning Foam? It’s super easy to apply. I use a mitt and just rub it into my skin in a circular motion like I do a moisturiser and it goes into my skin really well. Every time I’ve used it, I’ve made sure I’ve exfoliated my skin beforehand which makes the application much easier. Fake Tan is renowned for not having the best of fragrances and this was something that I'd prepared myself for. However, the Bondi Sands Self Tanning Foam has a really nice coconut scent to it when you apply it, which always gets me in the mood for summer. Having said that, I do find once it's drying it doesn't hold the coconut scent and instead changes to that more 'biscuity' scent that fake tan is known for, which isn't the best. Bondi Sands recommend that you leave the tan on for a minimum of one hour and a maximum of six hours before washing off. I must admit, that due to the smell and the unfamiliarity with wearing fake tan, I haven't been able to wear it for more than an hour, instead choosing to wash it off after an hour. Despite this, I've seen really good results. As we're not quite in the height of summer, I didn't want a full on tan, instead I just wanted a hint of colour to take the edge off of my super pale skin. I found that leaving the tan on for an hour and then washing it off, provided me with the glow I was after. Not only that, but it lasted a good few days and faded evenly which meant I didn't have to stand in the shower scrubbing it off. The longer you leave it, the darker the tan is and I think this would definitely last longer too, so I'm excited to try that once we hit the peak of summer. As I already mentioned, the Bondi Sands Self Tanning Foam is only £14.99, which is such a good price! Admittedly, there are cheaper brands out there, but I'm always a little worried about how good the quality is. Also, there are many other brands that are a lot more expensive and whilst I've never tried another brand, I do think Bondi Sands is really good value for money. Would I recommend Bondi Sands Self Tanning Foam? Yes, definitely! Whilst I have nothing else to compare it to, I do think it is a really good fake tan. If I can I use it successfully and I'm clueless when it comes to fake tan, then anyone can use it! Have you tried Bondi Sands Self Tanning Foam? I'd love to know your thoughts! Also if you want to share any fake tanning tips with me, I'd love to hear them, I'm still really new to this world! Such a good and helpful review Abi, thoroughly enjoyed reading it! I'm like you and I'm scared to buy and use fake tan as well in case it leaves me with horrible, uneven tan lines, so to hear that your experience went well is music to my ears and it might encourage me to try it out myself! I'm sure you'll hear about it in future tweets or blog posts about my experience if I actually pluck up the courage to do so haha!